The 3rd Annual Petal to Plate takes place in Carlsbad, from Thursday April 4th through Sunday April 14th. Taking inspiration from our beautiful Flower Fields at Carlsbad Ranch (open through Mother’s Day, May 12th), a number of resorts, spas, restaurants and breweries will celebrate this beauty with floral-inspired drinks, brews, food specials and spa treatments. 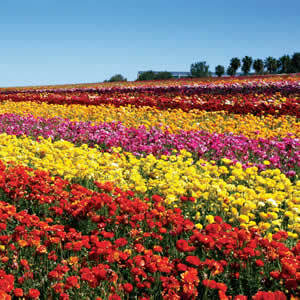 Of course you will want to visit the Flower Fields in person for your own inspiration and enjoyment. You can also take in the views from Armada Drive that runs along the top of the hill, overlooking the Flower Fields and the ocean beyond. Participating venues include Campfire (creative food and cocktails in Carlsbad Village); the Ocean Pearl Spa and the 20/Twenty Grill at the Westin Carlsbad Resort; Chandlers (2 special food offerings) and the Ocean Crest Spa at Cape Rey Hilton; and the Argyle Steakhouse at the Aviara Golf Club and the Aviara Spa at the Park Hyatt Hotel. And there’s more. Visit the Spa at the Omni La Costa Resort and Spa for treatment specials, Vigilucci’s Seafood & Steakhouse (there’s a special cocktail to enhance the beautiful ocean views), Park 101 in the Village (a 2-level restaurant with great views plus a special drink to toast those views), and lastly, for brew lovers, Draft Republic and Barrel Republic for special beers. You can read more about the 3rd Annual Petal to Plate venues and their offerings on the Visit Carlsbad website. And if you aren’t from the area, why not come for a visit – there’s lots to see and do!